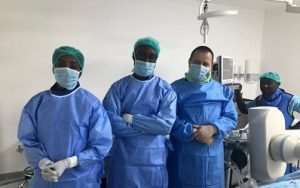 A seven-member team of Ghanaian doctors has performed the first-ever brain surgery in the country, without cutting the skull. The minimally invasive brain surgery is the technique by which health workers safely remove brain and skull-base tumours through smaller and more precise openings that minimise collateral damage; that is, injury or other damage inflicted on an unintended target such as blood vessels and nerves. Technically known as 'Endovascular brain aneurysm coiling' (because there is no need to cut into the skull to do the surgery), the technique passes a tube (catheter) through the groin (junctional area between the abdomen and the thigh on either side of the pubic bone) up into the artery containing the brain aneurysm, a process known as endovascular coiling or coil embolisation. Supported by a visiting interventional radiologist, Dr Itsvan Lazar from Hungary, the team performed an emergency minimally invasive surgery in the brain to stop bleeding, a condition medically known as 'Subarachnoid Hemorrhage'.